When space is limited, narrow aisle pallet racking can maximise storage space, save on building costs & can utilise Automated Storage & Retrieval systems. Narrow Aisle Pallet Racking is conventional selective pallet racking configured with narrower aisles that can be used with a specially designed turret truck. While these trucks are often more expensive than standard forklifts, using narrow aisles can give you major savings on building costs by allowing you to store more in less space, and gives option for automated storage and retrieval systems (ASRS). Minimises aisle width and increases net area utilisation. The use of an automated storage & retrieval system (ASRS) can be a highly cost effective form of storage where a large number of pallets need to be stored, and where the cost of land is high. 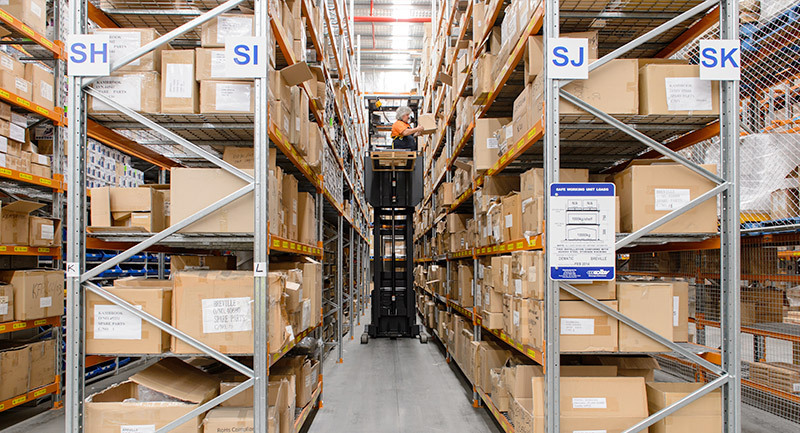 The ASRS accesses stock in a narrow aisle pallet racking system, which can be designed to utilise the full height of the building, and is a very dense pallet storage solution. Click here for more information on ASRS solutions from Dematic. Why ColbyRACK Narrow Aisle Racking? Like all Colby’s pallet racking solutions, our Narrow Aisle Pallet Racking systems are designed to meet rigorous international structural standards and exceed exceeding Australian standards. Designed by Colby's leading Australian structural engineers, our range of uprights, beams, frames, and connectors are made from guaranteed, high-quality, high-tensile steel. Top safety standards are further ensured by smart section design including strengthening ribs and reinforcing flanges. Compact small parts picking in double-deep very narrow aisle (VNA) racking helped increase the overall pallet storage capacity of Breville’s DC by more than 30% compared to conventional selective racking.